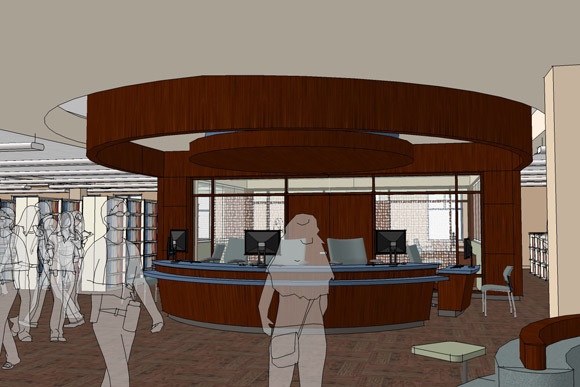 A conceptual drawing of the UBC library's new single service desk. The library at UBC’s Okanagan campus is currently being transformed to better meet the diverse needs of both the expanded campus community and the general public. "The library was originally built to accommodate approximately 3,500 students – we've nearly doubled our student base since then," says Karen Hill, manager, access services at the library. "The goal of the renovations is to enhance the student learning experience and ensure our campus library remains a place where students can come together in a discipline-neutral space." A single service point that combines circulation and reference. "The seating in the library will increase by approximately 25 per cent," says Hill. "And we always welcome community borrowers to our vibrant learning space. It is our hope that the additional space created by the renovations will encourage the public to visit the library more frequently and access the numerous resources we have available to them." Saturday and Sunday, 9:30 a.m. to 5 p.m.